Pangolins are small mammals of the order Philodota, often referred to as "scaly anteaters" for their defining physical trait: large, overlapping scales composed of keratin, the same proteins that make up human fingernails as well as rhino horns. These scales serve as a pangolin's primary defense from predators. 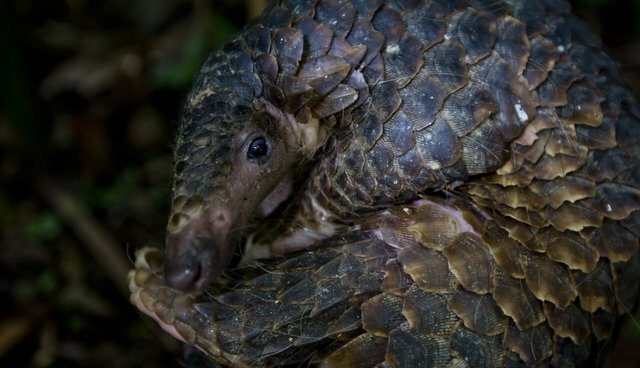 When threatened, the animal curls up into a tight ball, with its scales serving as effective armor (the word pangolin comes from the Malay word pengguling, meaning "something that rolls up"). Unfortunately, demand for pangolin scales, as well as pangolin meat, has caused tens of thousands of pangolins to be poached every year. Some researchers say that pangolins are the most commonly trafficked mammal in the world, according to the International Union for Conservation of Nature (IUCN). But conservation groups are stepping up. WildAid, for example, is preparing to launch a new campaign to raise awareness about the impact of the consumption of pangolin meat and scales on pangolin populations. The nonprofit organization will work with a network of over 100 media partners in China and Vietnam to distribute campaign messages to millions of people in an effort to reduce demand for pangolin products in Asia.